Home → Across America → SAM CHAMPION PLASTIC SURGERY? TV Weatherman Sam Champion, looks like he has his face pushed into a 70 mile per hour wind — in other words — his face looks stretched and pulled. Has Sam had some plastic surgery — maybe even a face lift? It sure looks like it. Something looks weird about him — is he just getting old or what? According to Dr. Raymond Totondi. a plastic surgeon at The Skylight Institute on Park Avenue in NYC, Sam is looking a little ‘repaired” as he heads towards the big time. Here are some pics of Sam Chmapion’s scars and some before and afters photos —-> Drastic Sam Champion Plastic surgery link. Some New Yorkers who are “in the know” think that Sam has gone into a kind of depression since Splash Bar has closed down, and maybe that’s why he has packed on the pounds and pulled his face back like a Hefty Cinch Sack, but others take a more homey approach to this change in Sam. “To me, Sam used to look like an All-American gay guy, and it was nice cause I wanted to set him up with my nephew Frankie who lives a few blocks away from me with his mother. I thought Sam was a cute guy and a perfect match for Frankie — and he gave good weather reports, ” said Mildred Sclafani of Staten Island, New York who, along with her husband, Broderick, runs a Bigfoot Lookout club in the Catskill Mountains of upstate New York. “Broderick and I do a lot of Bigfoot outings and we always depended on Sam for the weather. I even invited Sam over a few Sundays for my famous raviolis with vodka sauce. Yeah, I know that ravioli is already plural and I shouldn’t say ‘Raviolis’ but it sounds nicer to me and it reminds me of my mother and grandmother so I say it. So, what’s the deal? 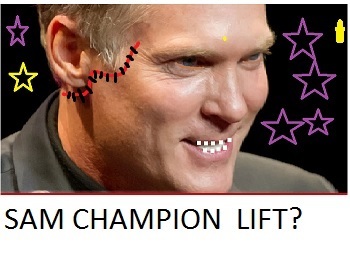 Is Sam Champion getting plastic surgery or is he facing into a strong wind? It looks like has had a face lift and an eye job — but we might be wrong. Gwenyth Paltrow Dating Joey Lawrence? He’s pathetic. Looks like an old queen trying to hold on to youth. Got too big for his britches and his own show failed. Now he’s slowy trying to crawl his way back into the spotlight. GET LOST. Ginger Zee gots the gig. We don’t want or need you back. See you doing my overnight work. Starting from the bottom again. Bottom? Should be used to that position by now.